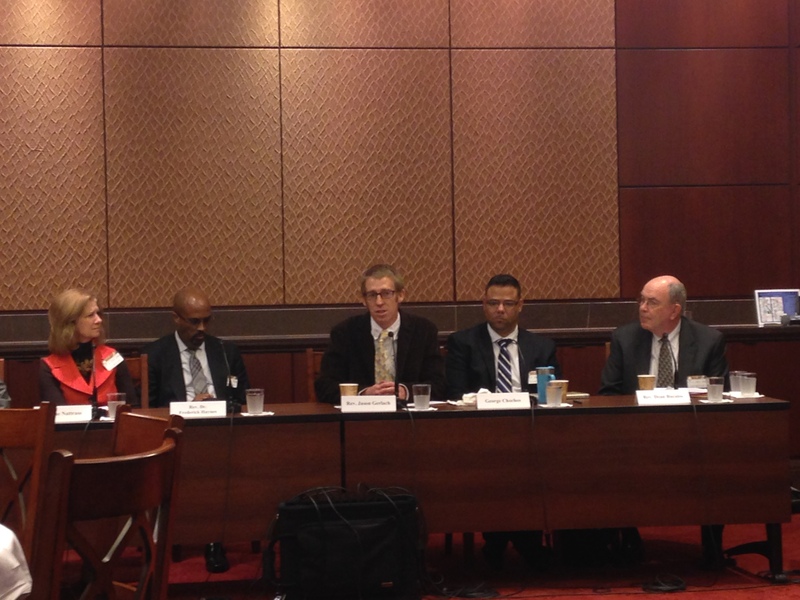 Jason Gerlach (center), associate pastor at Community Mennonite Church in Harrisonburg, Va., speaks at a congressional briefing in November about the need for reforms to the criminal justice system. Mass incarceration is a term that has been used more and more frequently in the U.S. and particularly in Washington this year. Sadly, it is an apt description of the state of the criminal justice system in the United States. The U.S. currently incarcerates an estimated 2.3 million people, more than any other country in the world. Decades of harsh policies such as mandatory minimums for illegal drugs have seen the prison population grow by more than 500 percent since 1980. African-American and Latino communities have been particularly hard hit by these policies, with recent statistics showing that while white men have a one in 17 chance of going to prison, African-American men have a staggering one in three chance. After years of trying to incarcerate their way out of drug addiction and other issues, some members of Congress have realized that reforms are needed. On October 22, the Senate Judiciary Committee passed the Sentencing Reform and Corrections Act (SRCA). If approved, the bill would be the first step toward tangible reforms of our criminal justice system. The SRCA would cut some mandatory minimums, mostly for drug offenses, and provide a number of other ways to reduce sentences. The bill would also allow some people to take part in work-release programs and would retroactively apply the 2010 Fair Sentencing Act, which greatly reduced the disparity in sentencing between crack and powder cocaine. The SRCA’s provisions for juveniles, while limited, are an important step forward. The bill would end the use of life without parole for juveniles and most cases of solitary confinement. Both are important acknowledgements of the need to treat juveniles differently from adults in the criminal justice system. The bill has a good chance of passing in 2016 and needs your support. But even if it becomes law, many reforms will still be needed in the U.S. criminal justice system. Formerly incarcerated people frequently struggle to re-enter society due to the many barriers that have been erected against them. Limitations on voting, receiving public assistance and employment are among the many challenges faced by returning citizens. Furthermore, mass incarceration will not simply disappear with the passage of the SRCA. U.S. prisons will still be filled with citizens, disproportionately African-American and Latino, who continue to be part of the largest prison population in the world. So while we support the SRCA and other reforms, we acknowledge that these are first steps on a long road to justice. In addition, MCC U.S. continues to support gun safety measures that are critical for all Americans. Representatives from several Brethren in Christ churches in Pennsylvania came to Washington this year to advocate for gun safety measures. Despite this and other advocacy efforts, Congress failed to consider, much less pass, serious gun reform in 2015.